And here I was, ready to paint my bedroom purple. But if 3M owns it, I can't, right? Wrong! 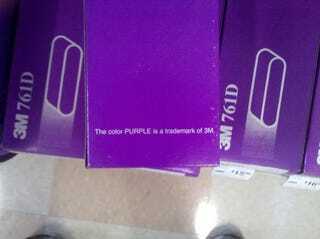 Although under US law 3M strangely does have a claim to the the color, it's not as bad as it sounds. Intellectual property law allows for what's called "trade dress"—the visual distinctiveness that, the hope is, allows consumers to differentiate between similar products on the basis of their origin. That means you can give your girlfriend a Tiffany necklace in that distinctive blue box—and know she's not going to open it and have a swarm of killer bees fly into her face. Or, y'know, some find some shoddier brand of jewelry. So a rival jeweler maker can't make boxes of the same hue, hoping to piggyback on Tiffany's visual reputation.